CARMEL, IN: A just-published book, Style, Elegance, and Wit: Rediscovering the Life and Art of James Spencer Russell, by the team of Carmel, Indiana-based art advocates, Ron and Julie Kern, rescues the memory of Indiana artist, James Spencer Russell, for all of us to know about and appreciate one of Indiana’s greatest modern artists. The Kerns discovered Russell’s art at an Indianapolis art auction almost a decade ago as it was being sold as part of Russell’s estate. Russell’s art, so riveting and so complex in its style, captured the Kern’s immediate curiosity and attention. With no idea of who Russell was, they collected several pieces of artwork that day. This led them to a journey of discovery to find out more about James Spencer Russell’s life and art. The journey took the Kerns to Kewanna, Indiana, where Russell spent his last years and where they met people who knew Russell, especially Wade Bussert, keeper of Russell’s personal archive. This led to three years of meticulous and relentless research to re-discover Russell’s life and artistic accomplishments. The Kerns tell Russell’s story with care and respect for an artist who remained ever dedicated to his craft all his days. Russell, born in Monticello, Indiana, graduated from Yale University’s School of Drama and went on to a successful career in set design in New York City during television’s Golden Age. He left that career to pursue art full-time and quickly rose to prominence in the New York art scene and beyond. Russell commanded recognition by virtue of the power of his art work alone and either exhibited solo or with other leading contemporary artists. Music and especially the literature of James Joyce remained a strong influence on Russell’s art all his life. At the age of 85, Russell passed away on November 4, 2000. Fortunately for all of us, Russell had many friends who supported the Kerns in their effort to make certain that Jim’s story was rightfully told and not forgotten. The Kerns have taken great care to present a thorough and well-documented portrait of an Indiana artist and also have included photographs of both Russell and his work throughout the book, which should become the go-to reference for anyone wanting to know more about this Indiana artist. This work by the Kerns is a fitting and long overdue tribute to one of Indiana’s own and one of our nation’s greatest modern artists. 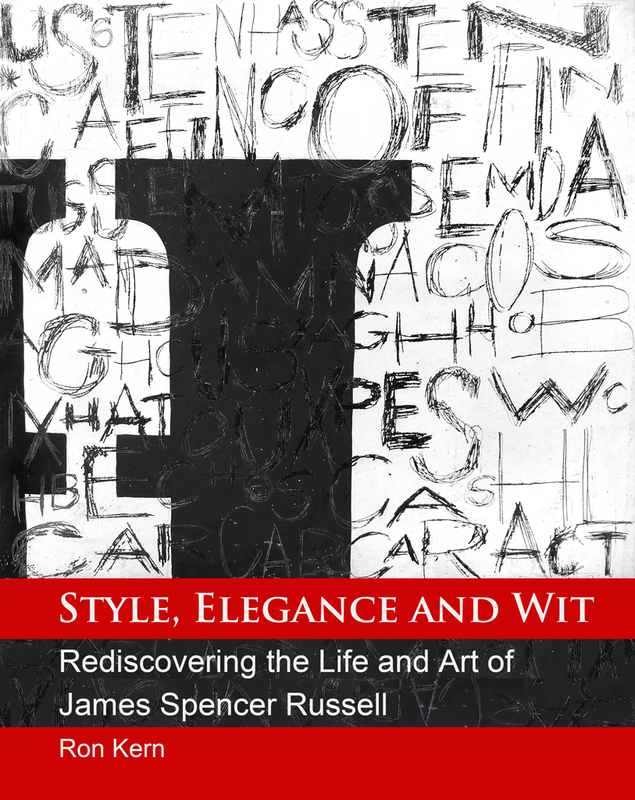 Go to this link for information about purchasing Style, Elegance and Wit: Rediscovering the Life and Art of James Spencer Russell, published by Open Sky Enterprises, Inc. Carmel, Indiana. A condensed version of the books text will be published in the catalog for the Indiana State Museum exhibition, Style, Elegance and Wit: The Artwork of James Spencer Russell.